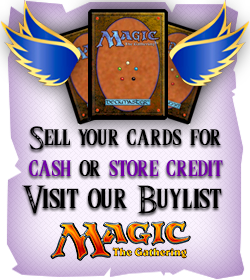 As an Authorized Internet Retailer with Wizards of the Coast, we can only ship Magic: the Gathering sealed products within the U.S and its Territories ONLY. In Store Pick Up FREE! Customers who would like to order on-line and pick up their order in the store to avoid paying for shipping are welcome to do so. Customers who select in-store pickup are required to pay online at the time the order is placed or we can't guarantee availability. All local orders, both on-line and in-store, are subject to local and state sales tax. Please note our posted store hours and allow one full business day for us to process orders placed on-line. Employees who are working during events that run beyond our normal store hours cannot be expected to leave the event to process an order made on-line earlier that day. **You may also choose to visit our local store and have an order processed by our staff. We at Tara Angel’s Magic, LLC, believe that making our customers happy will lead to more customers and more business in the future. Therefore, we are committed to providing prompt and friendly customer service to ensure that you are satisfied. Please read these policies to learn about buying and selling with Tara Angel’s Magic, LLC. Generally, Tara Angel’s Magic, LLC, will accept the return of any sealed product item within 30 days of the date the item was shipped, provided it is unopened and still packaged as new. A 15% restocking fee will be charged on all returns. If you wish to exchange an item for a different product, the restocking fee may be waived, but there will be an additional fee for sending the new item to you. * However, if you receive an incorrect or defective item from Tara Angel’s Magic, LLC, please contact us as soon as possible. If it is necessary to return the item because of our error, we will reimburse you for the cost of return shipping and waive the restocking fee. If you wish to return an item that has been opened but is not defective, including all trading cards, please contact us by phone or email so that we may address your concerns. *You may visit us in the Tallahassee Mall to avoid paying additional shipping charges. Refunds are requested after we receive and process your return. You should expect to receive your refund within four weeks of giving your package to the return shipper, however, in many cases you will receive a refund more quickly. This time period includes the transit time for us to receive your return from the shipper (5 to 10 business days), the time it takes us to process your return once we receive it (3 to 5 business days), and the time it takes your chosen payment method to process our refund request (see below for specific guidelines). We'll notify you via e-mail of your refund once we've received and processed the returned item. When you order, we need to know your name, e-mail address, mailing address, and payment information, such as your PayPal account or credit card number and expiration date. This allows us to process and fulfill your order and to notify you of your order status. When you place an order through our website, you will be opting in to receive our newsletters about various annoucements within the company. However, you may opt out of these e-mails at any time, if you wish to no longer receive them. How does Tara Angel's Magic protect customer information? Will Tara Angel's Magic disclose the information it collects to outside parties? Tara Angel's Magic does not sell, trade, or rent your personal information to others. We may provide aggregate statistics about our customers, sales, traffic patterns, and related site information to reputable third-party vendors, but these statistics will not include personally identifying information. Tara Angel's Magic may release account information when we believe, in good faith, that such release is reasonably necessary to (i) comply with law, (ii) enforce or apply the terms of any of our user agreements or (iii) protect the rights, property or safety of Tara Angel's Magic, our users, or others. Tara Angel's Magic is committed to protecting your privacy. We use the information we collect on the site to make shopping at Tara Angel's Magic as simple as possible and to enhance your overall shopping experience. We do not sell, trade, or rent your personal information to others. Tara Angel's Magic also provides links to affiliated sites. The privacy policies of these linked sites are the responsibility of the linked site and Tara Angel's Magic has no control or influence over their policies. Please check the policies of each site you visit for specific information. Tara Angel's Magic cannot be held liable for damage or misdoings of other sites linked or otherwise. Thank you for shopping at TaraAngelsMagic.com!